When my clients are proofing their images, they're looking at straight out of the camera shots that I have selected from their session. Since they're looking at unretouched images, I encourage them not to worry about lighting, distracting images or the coloring of the images, as these items will be corrected in the post-processing stage. Case in point - the image below was a favorite of the Strong family, but they were concerned about how hazy it appeared compared to the rest of the images. This was the result of shooting into the light and a resulting lens flare. They weren't sure if it could be saved. 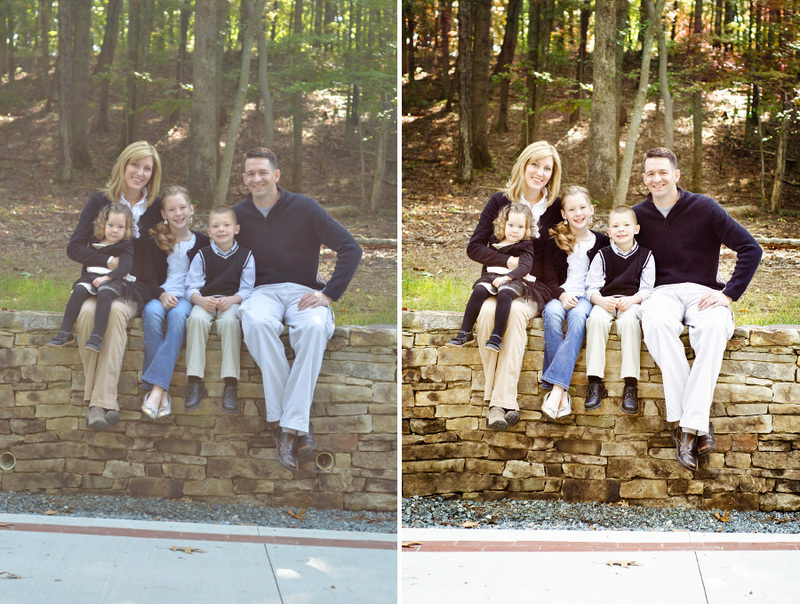 In the before and after, can you spot the differences between the two photos? Well, 98% of the problem was fixed within Adobe Camera Raw (this is why I shoot exclusively in RAW!) - the hazing, exposure and clarity was all retouched before I brought it into Photoshop. Additionally, I removed the drain pipes that I found distracting. It also bothered me that we were shooting on a hill and the sidewalk line was diagonal. Lastly, the leaves had not quite changed in the woods we were shooting in so I bluffed a little bit by adding a tad hint of color. Oh RAW, what would I do without you?